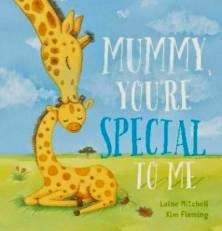 Mummy, You're Special To Me is a sweet picture book celebrating the strengths and skills of mothers and their special relationships with their children. Told in verse, the story begins and ends with baby giraffe and his mother. In between, a range of other animals enjoy time with their mums. Turtle Mummy builds excellent sand castles and knows about waves. Monkey Mummy paints pictures and climbs trees and Mummy Kangaroo tucks Joey in tight and tells stories just right. The illustrations glow. They are lively and luminous. They exude the happiness and light playful atmosphere portrayed in the text. The animals are sweet and in their own environments and if you look closely you will see that Baby Giraffe follows the story too, appearing in the background every page. While the text is a little awkward to read in places (words forced to make the rhyme work) the comfortable, cosy mother/child relationships portrayed make this easy to overlook. The refrain Mummy, you're special to me is used every page and this repetition adds even more rhythm to the story. Also the skills these mothers possess are relatable for young children - story telling, kindness, jokes, wisdom, encouragement and humour to name a few. With it's beautiful illustrations and sweet sentiment, this book is a lovely one for pre-schoolers to share with family, especially Mum.